Likely the most exciting thing to come out of Apple’s media event yesterday was the introduction of a new iPod Touch complete with front and rear facing cameras. The new iPod borrows many other features from the iPhone 4 including a new retina display, HD video recording and much more. Steve Jobs started the iPod Touch introduction by providing some interesting stats, namely that the iPod Touch is the most popular iPod ever. Along with it being the most popular iPod the Touch is also the number 1 selling portable gaming device outselling Nintendo and Sony combined. Retina Display with 4x the pixels. 326dpi, 24 bit color, LED lit. Apple A4 chip (likely similar to one used in the iPhone 4 and iPad). Includes: iPod, Headphones, USB cable, Quick Start Guide. 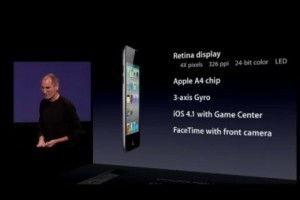 Prices for the new iPod Touch 4th Generation start at $229 for the 8gb, $299 for the 32gb and $399 for the 64gb.